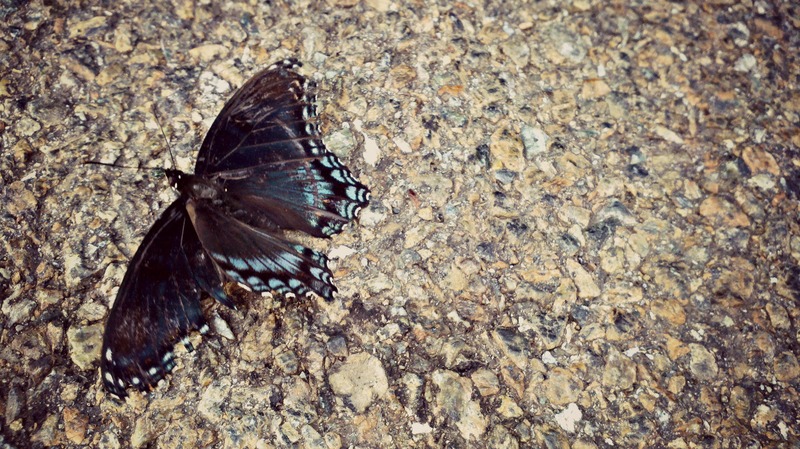 Pulling out of the grocery store yesterday, I spotted a butterfly. No, it wasn’t a happy flutter of blue-winged freedom, but a helpless worm, crawling in aimless circles across the macadam. 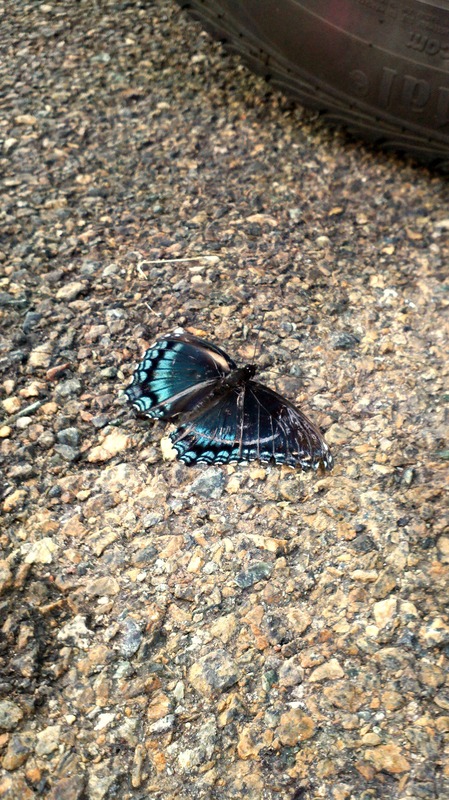 Its wings were broken and the beautiful blue markings were ripped and scratched off. My first thought was to pick it up and put it the grass. But how would that help the poor thing? It would just wriggle around in there until it starved to death. And so I kept on walking. Jumping into my car, I turned for one more look before driving away. 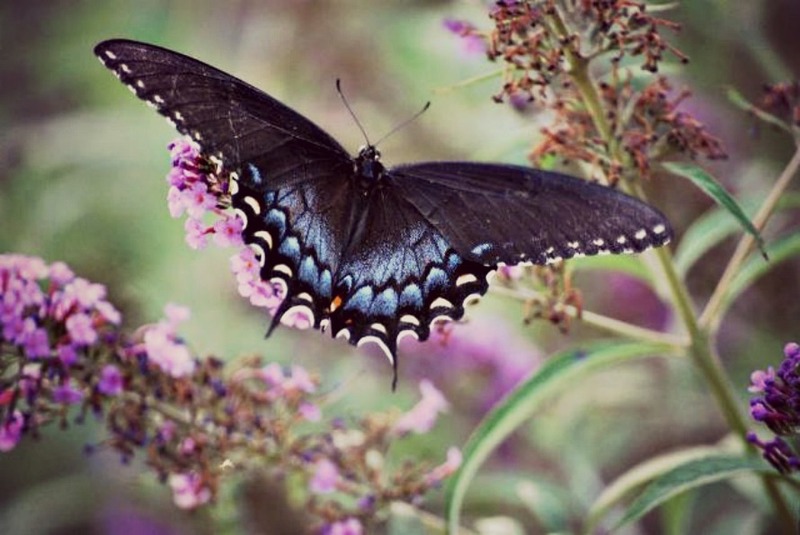 The butterfly was crawling towards the tire of a shiny silver convertible beside me. I could just envision the car speeding away and squashing half of the butterfly, leaving the intact part of its body to wriggle helplessly in pain until all of its internal organs oozed out and it finally withered up and died. That is my Pop’s line. In other words, standing by and doing nothing is an automatic fail. It’s a lesson I really need to learn. I can use my laid-back, diplomatic nature as an excuse for not doing the hard things. I know now that what she was asking for with her actions was not what she was asking for with her heart. I miss the mark so many times. Do you know what it is that keeps me from saying the hard things… from making calls that anger 98% of the crowd… from calling people on their bluffs? Pride. Plain and simple. I don’t like the feeling of hurting someone’s feelings. I don’t like the risk that they may be offended and never speak to me again. And so, I say what sounds good, and make calls that please everyone. It’s horrifyingly selfish, really. God is sure teaching me how much I need His vision and power. Still thinking these things, I’m happy to say that I hopped back out of the car, strode straight up to the butterfly, and ground it to powder in one forceful stomp. For a moment, I couldn’t believe myself. But then I thought of the innocent fellow shoppers who were no doubt watching me in fearful shock and amazement, and smiled. But I know I am, anyhow. And I’m very thankful for little things that teach big lessons. I guess there’s a good reason Jesus admonished us to consider the lilies…..